What’s one of the best things you can do to help speed up your weight loss goals? While you might think it’s diet and exercise, the truth is getting enough sleep is even more important! Not only do you need to be fully rested to give your all during your workout time, it may also help you consume less calories overall during the day and fend off cravings. A study published in the journal Sleep found a direct correlation between sleep and belly fat levels – subjects who slept five hours (or less), or eight hours (or more) a night gained more abdominal fat than subjects who stayed between six to seven hours of shut eye. It seems that extra belly fat comes from the extra calories we tend to eat when we’re tired (think about it – do you crave more sugary, high fat foods when you are tired or when you’ve slept well?). A separate study from Columbia University found that women who slept only four hours a night ate, on average, 329 calories more (and 31 grams of extra fat – yikes!) the next day, versus when they were well rested. The good news is you may not need to add a significant amount of extra sleep to see improvements — research recently published in the journal Appetite shows that just an extra 1.6 hours of sleep could be enough to reduce your cravings by as much as 62 percent! The bottom line? 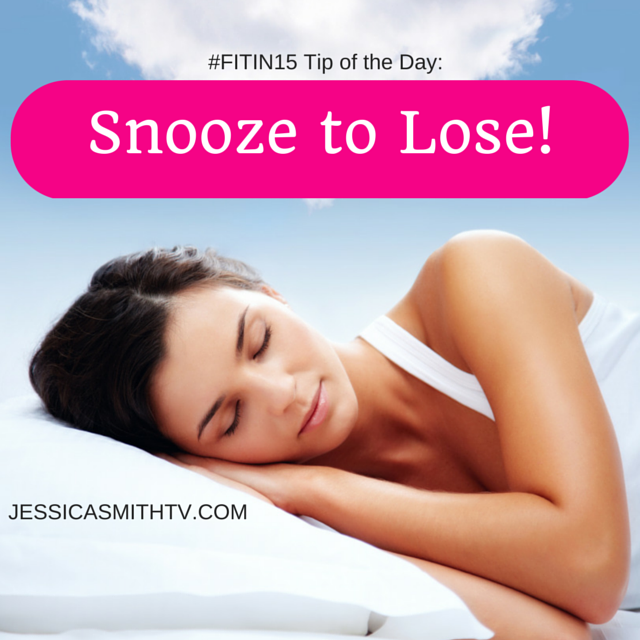 If weight loss is your goal, in addition to your workouts and healthy eating plan, be sure to make sleep a priority too. Too true, Jessica! Most sleep-deprived people struggle with their weight- from the freshman 15 for the night owls in college to sleepless mamas with new babies to those with insomnia. There is a good reason that animals hibernate in winter. We need REST.